Just because advent calendars date back hundreds of years does not mean that brands aren’t doing cool, interesting, and innovative work in the category. In 2018, advent calendars can target children or adults, cost anywhere $3 from to $100, and contain anything from traditional chocolates to imported cheeses. Below are five of our favorite advent calendars that we’ve seen so far this season. For anyone planning to host a holiday party, these dual advent calendars from Aldi are a fun and unique offering. One is filled with twenty-four “festive imported mini cheeses,” while the other contains a variety of mini wine bottles. This is obviously much more grown-up than traditional advent calendars, and puts an interesting (and tasty!) spin on the tradition. This “whimsical wooden keepsake box” from Harry & David is filled with malt balls, candy-coated popcorn, macaroons, shortbread cookies, and peppermint truffles. Unlike traditional advent calendars that conceal a treat for every day of December through Christmas Eve, this instead has twelve larger boxes, which are filled to make a series of heartier snacks. 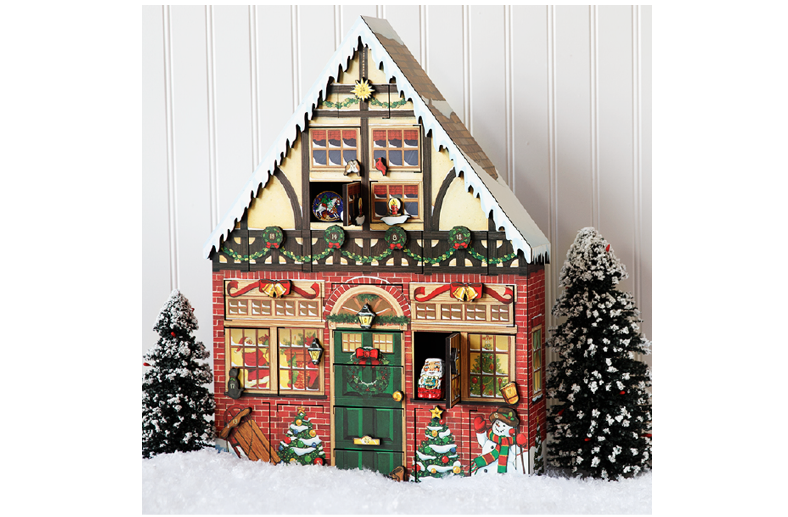 Like the calendar from Harry & David, Mackenzie Limited’s beautiful advent calendar is made of solid wood and is intended to be reused year after year. 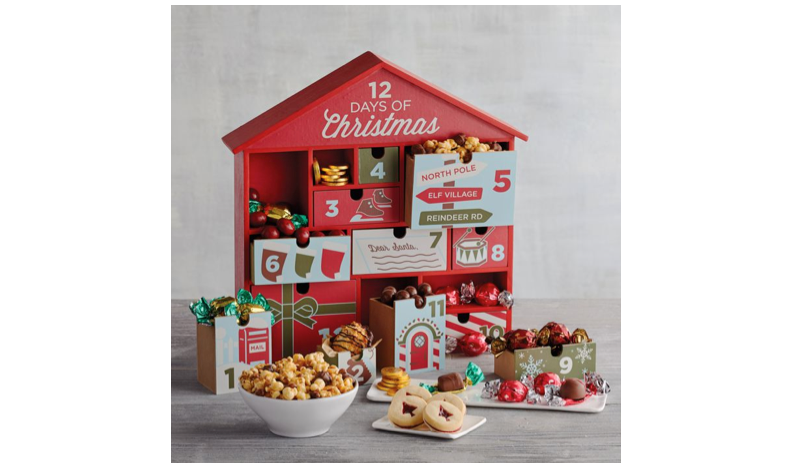 Each door is stocked with special treats, and the calendar was featured in the Netflix original movie The Holiday Calendar. 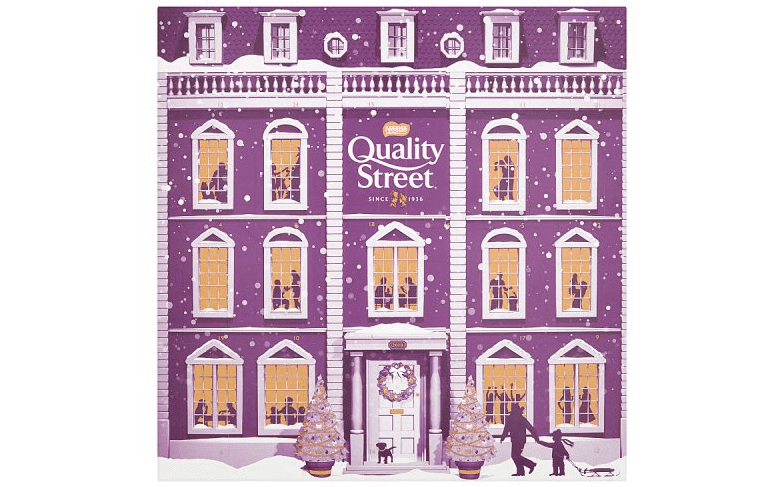 Quality Street is an iconic candy brand in the UK, and is considered a staple during the holiday season. This year, parent company Nestle has released the first-ever Quality Street advent calendar, to much excitement and anticipation in Britain. 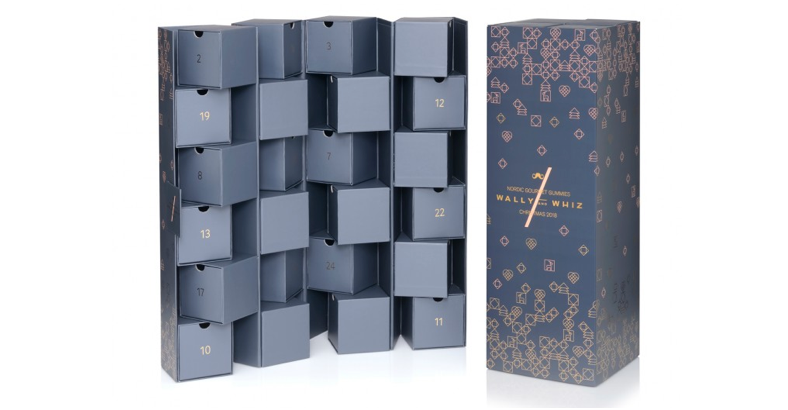 According to Dean & Deluca, Wally and Whiz’s advent calendar is “a study in Danish design and tradition,” and each numbered box contains a small package of gummies “in uniquely Scandinavian flavor combinations.” We appreciate the calendar’s beautiful and unique color options, as shoppers can choose from either periwinkle or peach, atypical of seasonal packaging. Whether they choose to go deep into traditional imagery or shake things up a little with interesting colors and patterns, food and beverage brands that really put effort and interest into their advent calendar designs are likely to win the season. By paying attention to significant visual and culinary trends, brands have the opportunity to be a part of consumer’s lives every day for the entire month of December.